Converting a 40-plant marijuana felony charge to a half-ounce misdemeanor | Jon Katz, P.C. In late 2006, I blogged about getting a thirty-plant Maryland marijuana felony prosecution reduced to a simple marijuana possession conviction, and a medical marijuana sentence of a $100 fine plus court costs, which ultimately was converted to a probation before judgment. The stakes were raised for me last year through this month in Virginia with a 43-plant indoor marijuana grow bust, carrying felony exposure of five-to-thirty years in prison, versus the five-year maximum exposure for my above-described marijuana felony case. Virginia has no medical marijuana law, other than to enable acquittals for simple possession with a prescription, except that no doctor in the United States writes marijuana prescriptions, because prescribing marijuana risks a loss of one’s DEA license to prescribe medicine. Instead, in California and other medical marijuana states, doctors give the green light for medicinal marijuana by a written recommendation, not by a prescription. With my client’s permission, I provide the details of our defense. My client used marijuana for very medicinal reasons, and growing his own protected both the quality and supply of his medicine. A Virginia marijuana felony conviction is not available where the marijuana is only for one’s personal use. As with my Maryland thirty-plant case, for the Virginia case we retained the services of marijuana cultivation expert Chris Conrad — author of Cannabis Yields and Dosage — and medical marijuana expert David Bearman, M.D. I arranged for Chris Conrad to examine the seized marijuana. The prosecutor and I joined, along with the lead investigating police officer. It is good for the prosecutor to be present to appreciate Conrad’s authoritativeness and credibility. 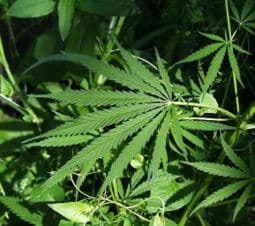 In this instance, the police had properly packaged, dried (lest the plants get moldy and rot) and saved the marijuana plants to enable identification between mature and immature plants, and female and male plants. Mature female plants provide medicinally beneficial marijuana bud, leaving one to discount male plants and immature plants from the personal medical marijuana use analysis. Chris Conrad determined that my client’s indoor grow operation would yield 0.9 to 1.3 daily grams of marijuana, to provide one to two marijuana cigarettes, which is substantially less than is made available to federal medical marijuana recipients. Before Chris Conrad examined the marijuana, it had already been tested and weighed by a Virginia government chemist, who weighed in the whole dried plants — well beyond the buds — at several pounds, despite Chris Conrad’s measurement of just a little over a pound. I asked the chemist about the discrepancy, and she was satisfied that she had reached a correct weight. I mentioned the drastic discrepancy with Conrad’s weight, and asked about any notes she may have taken about the weight to change her mind about her measurement. Subsequently, the chemist faxed me an amended certificate of analysis providing a weight very close to Chris Conrad’s measurement, thus providing further credibility to Conrad’s opinions on this grow operation. We benefitted from the absence of indicia of any intent to sell marijuana. The police found no packaging material for selling, no buy or sell sheets, and no substantial amounts of cash. Moreover, the marijuana was grown for quality rather than yield; people growing for their own use grow for quality, and growers for sale often seek higher yield. Finally, medical marijuana expert David Bearman reviewed our client’s health situation and confirmed the significant medicinal benefits that marijuana provided him. All too often, prosecutors offer, as "expert" witnesses, police who testify at trial that a substantial quantity of seized drugs would have been intended for sale. When supported by the evidence, experts like Chris Conrad and David Bearman can blunt such testimony when marijuana is grown for personal medicinal use. However, prosecutors call their intent-to-distribute witnesses without spending a dime, whereas defendants must invest significant funds to hire beneficial counterexperts. Many defendants cannot afford such expert assistance, and one wonders how many indigent defendants’ lawyers are provided the funds to obtain such experts. Of course, this high expense of getting a fair trial through hiring such experts is another reason that marijuana needs to be legalized, now. After many hours of preparation, a lengthy preliminary hearing and motions hearing, we ultimately negotiated a guilty plea reducing a felony marijuana manufacturing charge to misdemeanor possession with intent to distribute less than a half ounce of marijuana, with a short sentence to be served on weekends. This case ended happily, all things considered. Jon Katz.